Today’s panini recipe is inspired by my new adopted “dad” – Curt from Bucky’s Barbecue and Bread. Curt and I are participating in the Adopt-a-Blogger event and before I tell you more about him and the event, let me describe this Barbecued Salmon sandwich I made to welcome him to Panini Happy. As his blog name implies, Curt is a barbecue guy and so on this final day of summer I kept my panini maker in its box for a change and fired up my trusty Weber gas grill. Wild coho salmon is basted with a layer of barbecue sauce and crusted in panko bread crumbs before being grilled to perfection. It’s then transferred to some lightly-charred rustic bread, with a generous amount of barbecue remoulade, fresh tomatoes and red onions. I want you to know that this sandwich now ranks among my all-time favorites! If you haven’t already heard about the Adopt-a-Blogger event, hosted by Kristen at Dine & Dish, it’s a wonderful mentorship opportunity that brings together those of us who are newer on the block and more “seasoned” (pun intended!) food bloggers. 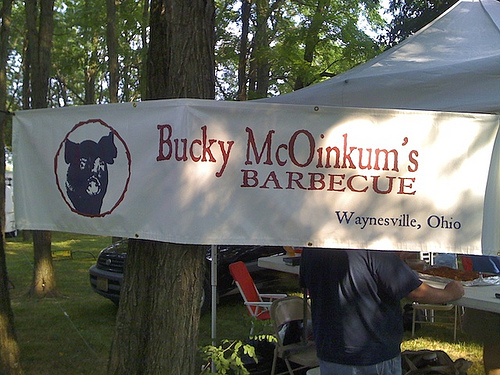 I was pretty impressed when I learned that Curt competes in barbecue competitions – how cool is that? I’ve seen those competitions on the Food Network and I’m always in awe of the passion and dedication of these folks who start up their smokers and grills in the wee hours in pursuit of the perfect ribs, brisket, chicken or pork shoulder. If you’ve ever wondered what it would be like to be on the competition circuit, you should definitely check out his blog for some really interesting insights. Curt’s been honing his barbecue skills for four years now, and along the way also picked up a keen interest in baking bread. I’m thinking that between his home-baked bread and his grilled meats it’s just a matter of time before he moves into sandwiches too! To make the barbecue remoulade: Combine mayonnaise and 1/2 cup of the barbecue sauce in a medium bowl. Mix in green onions, parsley, celery and garlic. Season with salt and pepper to taste. Cover and refrigerate until sandwich assembly. Divide salmon into 4 equal portions. Brush remaining barbecue sauce over the top and sides of the salmon (not on the outer skin). Press panko crumbs onto the top and sides of the salmon. Brush oil onto the grill grates to prevent sticking and grill salmon, skin side down, for 8-10 minutes until cooked through. When salmon is nearly done, place the bread slices on the grill to toast for about 30-60 seconds. To assemble each sandwich: Spread a generous amount of the barbecue remoulade on two slices of bread (NOTE: You will likely have extra remoulade left over). Arrange a layer of red onions on one of the slices of bread. Remove the skin from the salmon and place the salmon on top of the onions. Add tomato slices and close the sandwich with the other slice of bread. Serve and enjoy! * You can also broil the salmon in a regular oven or toaster oven for 8-10 minutes. Great looking sandwich! I have to say that I love good grilled salmon. I always am up for a Salmon anything, especially a good looking sandwich. Love everything about this one! Whoa, this is just incredible! You know – this year I let the computer do the matching, and one thing I liked about this match between you and Curt is that you both run great blogs focused on a specialty item (you panini’s Curt BBQ). It takes a lot of talent to keep a blog going when you choose to focus on one main thing, and I think the two of you have both done it so well! Can’t wait to see what you cook up together. This looks so great! I like the idea of doing it on the grill. OMG, this is one of the best things I’ve ever seen! I wish I could just take a huge bite out of that sandwich. Looks delicious. I’ve been grilling salmon all summer, and tossing chunks of it into salads. 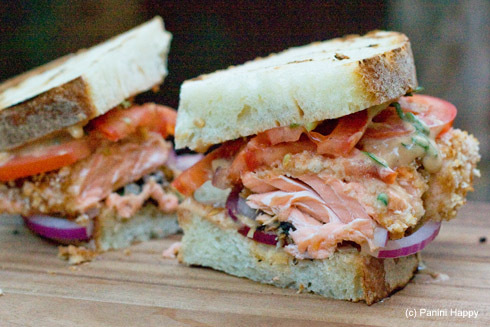 A panini is such a good idea — will try it with the next side of salmon. 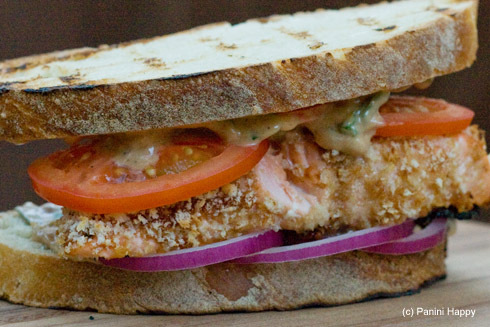 My husband would absolutely love this sandwich – he is a huge salmon fan. Lovely photo too. Beautiful, I love everything about the recipe. Hope to try it soon! That sandwich looks awesome! I love your photos and the taste combo is wonderful. Another great panini! I gotta get a panini maker for sure now! Living in 1 of the great BBQ capitals of the world, I take my virtual hat off to you. Never has barbecued salmon looked or sounded more delightful. They need this on some of the restaurant menus around here! A nice filet of grilled salmon is a lovely thing to behold! And this sandwich — well, it looks just perfect. Good luck with that partnership! bucky mcOinkum? haha.. That’s awesome. The adoption of Curt was a brilliant idea. Your Panini combined with Curt’s BBQ prowess has me running off to prepare this for my lunch guests! .-= Richard´s last blog ..How To Cook Salmon =-. Grilled a salmon on Friday. Sunday at 4pm searched for something to do with leftover salmon and a newly acquired panini maker. Sunday at 5:30pm, my husband and I are wowed at the easy to prepare, delicious, restaurant quality, panini we just finished. Thank you for your fantastic recipe. I look forward to trying all your recipes and will be a devoted follower. Keep up the good work! How perfect! I’m so glad you liked it. Have a great time with your new panini maker! Next post: Panini Happy is a Guest at Inn Cuisine!